An orthodontic consultation is very comprehensive and takes 45 minutes to an hour. A full intra-oral and extra-oral examination is done. Panoramic and Cephalometric x-rays are taken. Impressions for study models are done. Extra and intra oral photographs are taken. A Complete diagnosis and treatment plan is done, which will be presented on a second appointment. Orthodontic problems in children can be addressed as early as 5 years. Sometimes early intervention can prevent long orthodontic treatment later on in life. The most important things to look out for are habits that some children might have like thumb sucking. These habits can cause skeletal imbalance and can be treated very effectively early on. Any procedure that eliminates or reduces the severity of malocclusion in the developing dentition. All simple measures that eliminate the developing malocclusion. Interceptive orthodontics is a phased type of orthodontics which is the practice of extracting malocclusions once they are detected in an attempt to avoid adult malocclusion. Tooth growth is used to address developmental occlusion problems. This is done in two situations – by retaining deciduous teeth, and where there is malocclusion in the deciduous teeth and extracting these teeth can allow the patient to correct itself during the growth phase. Interceptive orthodontics improves malocclusions aside from improving the child’s appearance. Malocclusions occur due to a tooth or jaw misalignment. It affects the way a child chews, smiles, cleans his teeth or even how he feels about his smile. Crowded teeth can make it difficult to brush and floss the teeth. This can later on lead to tooth decay and periodontal disease. Meanwhile, protruding teeth are prone to accidental chipping. Unfavourable growth and uneven tooth wear may result from cross bites while tongue-thrusting habits and speech impediments may result from open bites. To prevent unwanted incidents from happening and for proper bite and jaw alignment, consult your family dentist and have your kids’ teeth formation checked during dental visits to ensure proper bone alignment and tooth growth. Removable appliance therapy for children (plates and retainers). Removable appliances can be used to correct mal-occlusions in kids from a very early age. Some of the most common problems that can be treated are prolonged thumb sucking and dummy sucking, as well as other habits effecting the development of the teeth and face. These appliances need be worn for 3-6 months. The cost of removable appliances is significantly less than fixed braces, and can also prevent long and invasive treatment later in life. These still remain the most popular type of braces and provide a very effective solution to the many orthodontic problems that exist. Relative to their predecessors, the metal fixed appliances are much smaller, thinner and easier to clean. The placement of these fixed appliances is simple, pain free and takes approximately 20 minutes per arch. The braces are usually adjusted every 6 weeks. There is some discomfort in the days following the initial placement and the subsequent adjustment of these braces, however, most people do not need to take any pain relief. For the small proportion of people who do, it is effectively controlled by mild pain killers e.g. paracetamol or nurofen or whatever you would take for a mild headache. The duration of metal fixed appliances ranges from between 4 to 24 months depending on the complexity of the bite. These are the second most popular type of braces. Because of their clear-tooth colored appearance, they are popular with patients who wish to minimize the visual effect of braces. The brackets (the part of the brace that is glued onto each tooth) differ from the metal fixed appliances as these are made from a tooth color ceramic material. Healthy teeth can be moved at any age. Irregular teeth and a poor bite can contribute to gum and bone loss, abnormal wear of the biting surfaces of the teeth, cavities, areas of weakened enamel and surprisingly on a psychological level, it is incredible how mal-aligned teeth can greatly affect personal contentment and self-esteem. Because orthodontic treatment can be successful at any age, an increasing number of adults are getting braces. No longer do people associate braces with teenagers, as no patient ‘is too old’ to have their teeth straightened. Often, adults report that they have had a course of braces as a teenager but did not receive retainers to wear long-term and over the years they have noticed their teeth gradually moving back towards their original position. We offer all our adult patients a permanent invisible retainer on the inside surfaces of the teeth in addition to the regular night-time plastic retainer. New techniques greatly enhance the treatment options available to you and include traditional metal braces (although smaller and much less noticeable now), clear ceramic braces and /or wires and removable see-through appliances. During your initial examination with us we will outline the appropriate options for you, the duration and the cost of the proposed treatment. Aligners are an alternative treatment program for those that would not consider traditional braces. These braces are removable and virtually invisible and because they are removed for eating, there is a greater choice and less restriction on your diet. Brushing and flossing is facilitated as you have complete and normal access to all areas of your teeth. The significant difference between these braces and the conventional fixed braces is that fixed braces are working 24/7, whereas when these are removed for cleaning, eating and the occasional social event, tooth movement is immediately disrupted and no progress is made. However if you are committed to wearing the aligners as much as possible and removing them only to eat, drink, brush and floss, then you will quickly see the improvement in your teeth as they gradually move towards the pre-determined position that has been planned. The series of clear aligners (similar to thin gum shields) are generated by computer simulation. Each set of aligners is normally worn for approximately 2-3 weeks. As you progress towards the next set within the series, you will observe an improvement in the of your tooth position. 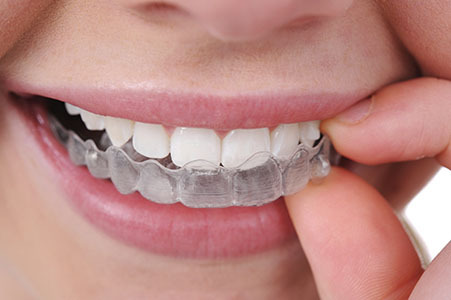 Many patients find these clear aligners quite comfortable, due to the lack of metal wires or brackets. Treatment time can vary from 6 months to 26 months and the average number of aligners worn is approximately 20. But there would be huge individual variation on this figure. Invisalign also allows you to view your own proposed treatment progress onscreen. So you can visualise how your teeth will look once straightened at the end of aligner treatment. Adults can have conventional metal braces or clear braces. Metal braces are sometimes used on the lower jaw only, and white braces are used on the top teeth that are more visible. The term, ‘conventional braces’, simply describes the type of braces that we are all generally familiar with. Your treatment can last up to two years, depending upon the amount of movement necessary. Once your treatment is completed you will need to wear a clear night-time retainer for at least a year which holds the teeth in their new position until they settle permanently into their new position. Ceramic braces are made of a clear or tooth colored material, and is usually very popular with adult patients. The cost of clear braces are usually a bit more than metal braces. Short Term braces are the most natural, most conservative and least invasive approach for you to improve your appearance. Simply said, 6-month braces (short term orthodontics) are used to improve the appearance of upper front teeth or lower front teeth in a very short time – usually about six months. It is limited orthodontics not comprehensive orthodontics. The objective is to move only the front six to eight teeth only and not change the bite overall. Because the objective is limited the time span to achieve a more aesthetic smile is very short. 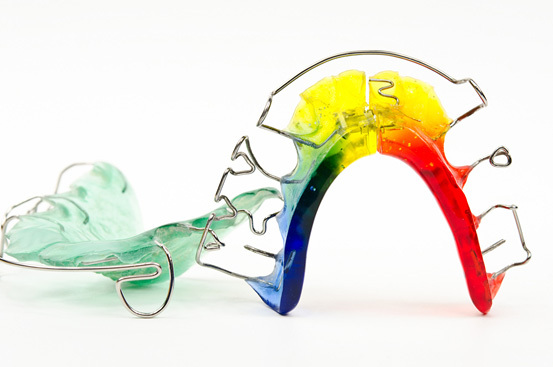 Traditional metal orthodontic braces are normally placed for the 6-month braces. However, if preferred we can use ceramic or white brackets instead of the metal ones. This approach is faster and more precise than Invisalign, which uses clear trays.